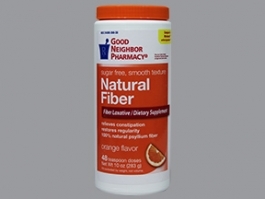 Get your daily dose of fiber the easy way with the GNP® Orange Natural Fiber Supplement. With more fiber in your diet, you may feel less bloated and you avoid constipation. Made with 100% natural psyllium fiber, a teaspoon serving helps reduce your risk of heart disease by lowering your cholesterol. Plus, when you improve regularity, you may notice that your skin, nails and hair look healthier and you feel more energized. The sugar-free laxative has a smooth texture, so the laxative powder is easy to mix and digest. Take a teaspoon of the 15.9oz Gluten Free Fiber Supplement once in the morning, for an easy way to promote healthy digestive health. Take each dose of this product with at least 8 ounces (a full glass) of water or other fluid. Taking this product without enough liquid may cause choking.